A Korean research team jointly led by Professor Chan Beum Park of the Materials Science and Engineering Department at Korea Advanced Institute of Science and Technology (KAIST) and Dr. Kwon Yu from the Bionano Center at the Korea Research Institute of Bioscience and Biotechnology (KRIBB) conducted research to suppress an abnormal assembly of beta-amyloids, a protein commonly found in the brain, by using photo-excited porphyrins. Beta-amyloid plaques are known to cause Alzheimer's disease. This research finding suggests new ways to treat neurodegenerative illnesses including Alzheimer's disease. It was published online as the lead article in the September 21th issue of Angewandte Chemie. The title of the article is "Photo-excited Porphyrins as a Strong Suppressor of ß-Amyloid Aggregation and Synaptic Toxicity." Light-induced treatments using organic photosensitizers have advantages to managing the treatment in time and area. In the case of cancer treatments, doctors use photodynamic therapies where a patient is injected with an organic photosensitizer, and a light is shed on the patient's lesion. However, such therapies had never been employed to treat neurodegenerative diseases. Alzheimer's starts when a protein called beta-amyloid is created and deposited in a patient's brain. The abnormally folded protein created this way harms the brain cells by inducing the degradation of brain functions, for example, dementia. If beta-amyloid creation can be suppressed at an early stage, the formation of amyloid deposits will stop. This could prevent Alzheimer's disease or halt its progress. 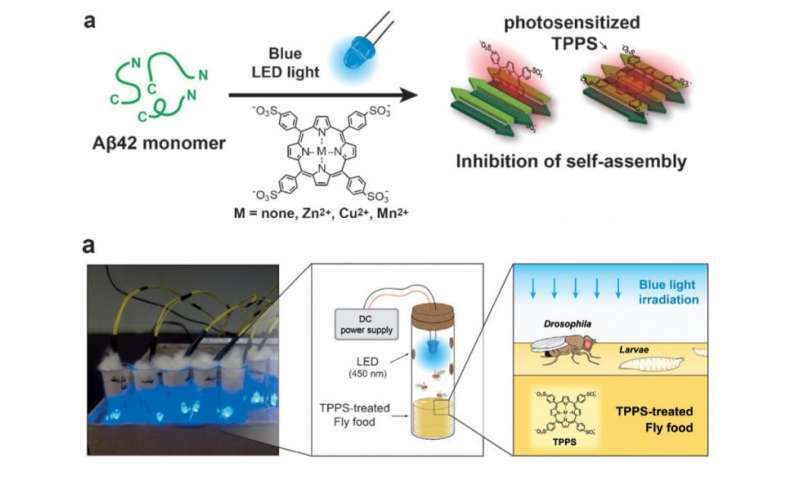 The research team effectively prevented the buildup of beta-amyloids by using blue LED lights and a porphyrin inducer, which is a biocompatible organic compound. By absorbing light energy, a photosensitizer such as porphyrin reaches the excitation state. Active oxygen is created as the porphyrin returns to its ground state. The active oxygen oxidizes a beta-amyloid monomer, and by combining with it, disturbs its assembly. The technique was tested on drosophilae or fruit flies, which were produced to model Alzheimer on invertebrates. The research showed that symptoms of Alzheimer's disease in the fruit flies such as damage on synapse and muscle, neuronal apoptosis, degradation in motility, and decreased longevity were alleviated. Treatments with light provide additional benefits: less medication is needed than other drug treatments, and there are fewer side effects. When developed, photodynamic therapy will be used widely for this reason. Professor Park said, "This work has significance as it was the first case to use light and photosensitizers to stop deposits of beta-amyloids. We plan to carry the research further by testing compatibility with other organic and inorganic photosensitizers and by changing the subject of photodynamic therapy to vertebrate such as mice."